Spencer is hazed by the members at the frat party. Warren and Spencer sing along to this song in the car as they drive away from the break in at the fast food restaurant. Spencer discusses to Warren at a party about the rare book. Plays in the car radio as Warren and Spencer travel to New York. Warren throws up outside the bar as he talks with Spencer on traveling to Amsterdam. Warren arrives in Amsterdam and meets the black market buyers. Eric is listening to death metal on his earbuds as he is scribbling on his notebook at accounting class. Eric waits for Warren at a Chinese restaurant. Spencer tases the librarian as he, Warren and Eric steal the book. Warren goes through with the group on the procedures and protocols before the robbery. Day of the robbery; Spencer and Eric arrive at class for finals while Chas steals a license plate and Warren buys a taser. Continues as the group applies the prosthetics on their faces. Warren turns on the car radio of Chas’ car. The group abandons their plan and leaves the library building. When the FBI raids the group’s houses. Song from the American Animals Official Trailer #2. 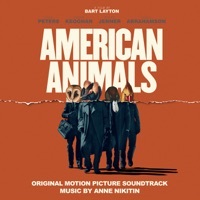 Song from the American Animals Official Trailer #1.
what is the group singing the song as the credits are onscreen?